Keto App - Discover the best keto recipes, articles and guides to inspire your low carb lifestyle! Here at Keto App we’ve scoured the world to bring you the tastiest keto, paleo and low-carb recipes from the very best home cooks, chefs and bloggers in the low-carb community. 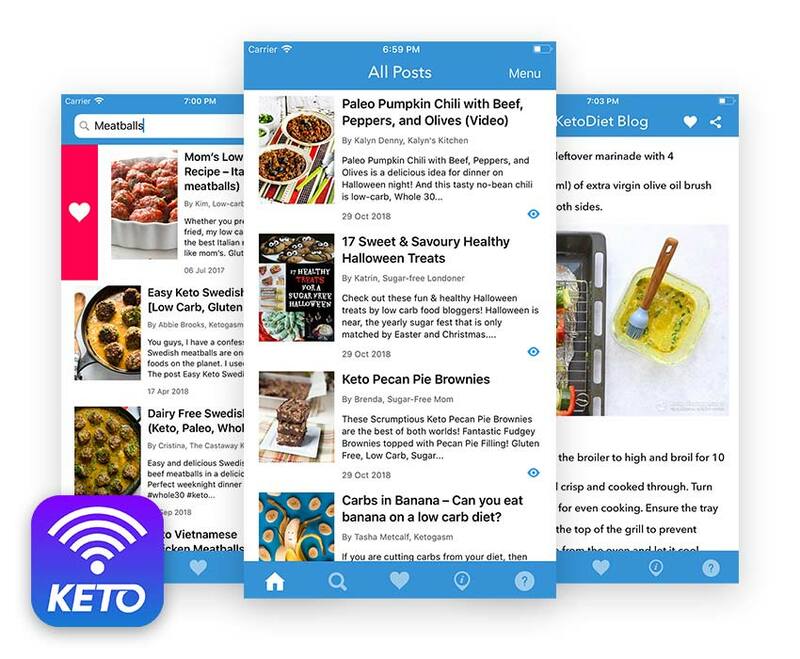 Keto App is the place where bloggers, big and small, can get the recognition and respect they deserve for all the passion and hard work they lovingly share with us for free. And because we believe keto isn’t just a diet, it’s a way of life, you’ll also find expert articles, guides and advice on how to stay keto fit and healthy for life. Ready to be inspired by perfectly crisp keto granolas, fluffy and light grain free breads and unforgettable gooey brownies? We are the community for people who love to cook low carb. Discover more than 10,230 recipes, articles and guides in the Keto App. Raspberry Cream Cheese Coffee Cake – Keto! Keto App collects no user information or any form of anonymous usage data. Please don't contact us to delete your data, there is nothing to delete. Note: Keto App links to extetnal sites. When browsing external sites via our app they may collect visitor data in the same way they would do when using a web browser such as Safari or Chrome. Although we have no direct control over the content websites display if we discover any innapropriate content the offented site will be removed and banned. The resources listed in Keto App are not intended to be fully systematic or complete, nor does inclusion here imply any endorsement or recommendation. We make no warranties, express or implied, about the value or utility for any purpose of the information and resources contained in Keto App. It is recommended you first consult with your doctor about any dietary changes, especially if you are pregnant or nursing or have any health issues such as diabetes, thyroid dysfunction, etc., as your health-care provider may need to adjust the medication you are taking. Further, Keto App is not intended for the treatment or prevention of any disease, nor as a substitute for medical treatment, nor as an alternative to medical advice. Recommendations outlined in Keto App should not be adopted without a full review of the scientific references given and consultation with a health care professional. Discover the best keto recipes, articles and guides to inspire your low carb lifestyle!